It's flippin' hard work. And everything takes roughly 3 times as long to accomplish if it gets done at all! I actually started writing this post in September! But please, read on because amongst my moans and musings you may very well find encouragement and hope! And HOPE is everything. All mothers know that being a mum is a full time job in itself, often feeling more like I am the 24/7 manager of a small, poorly funded correctional facility. (I borrowed that simile from a comedian... it's so perfect) Nothing can prepare us for it. But there, amongst the stubbornly vast spread of odd socks taking up half my bedroom floor I will still tell you I wouldn't trade it for anything. So I will proceed to share some strategies I have found helpful to maintaining a creative life amongst the socks. Let go of maintaining everything all the time (If you ever actually managed to do this! Or just let go of the ideal of consistently maintaining!) Creating must come in seasons, which might mean a season of clean laundry sitting in a Jabba-the-Hut pile for sustained periods of time, while you concentrate on a new series. You'll make something that will change the course of things and make a difference to your life 5 years from now, but nobody will remember the Jabba laundry pile much. Lucky for me I have a husband who is an absolute gun at vacuuming. So much more thorough than I am, it really saves me time and energy to wash those clothes and build that Jabba. SEASONS. There will be time to come back and set it all straight. You might feel judged, but trust me- it's TOTALLY worth it in the end!!! I tell people "sure, come over! My house will help make you feel better about your house." Make a space for yourself. Somewhere you can get it all out and leave at a moment's notice. Even if it's just a tray with some watercolours and paper that you can slide up on a shelf when the mini pips wake up from their nap. This then leads into simplifying your home so that it doesn't take twice as long to keep organised. Simplify meals to save time and energy. Big salads and one-pot meals are delightfully efficient. And if you're organised enough to order your groceries online and have it delivered to your bench it sure takes a load off! Carefully prioritise your time. Obviously caring for your family has got to be right up there, but invest what's left over in activities that nourish your creative soul rather than instantly-gratifying-type ones. In layman's terms, if you want to get somewhere with art and soul, stop spending precious time on Netflix and Facey. You will be richer for it. Learn art from your kids. Seriously- not even kidding. Each of my 4 children peaked a golden age of abstraction at age 3 1/2. Learn the art of spontaneous flow. The art of dancing on paper. The art of adventure and non-attachment. Give them all kinds of media mixes and watch the brilliantly unorthodox procedures elapse. Try working like they do. Give them charcoal, black ink, pastel, thick paint, runny paint, gluey paint. Give them just two colours sometimes and extra scraps to stick onto the wet paint. Let them experiment with applicators: brushes, sponge, anything to make prints, use sticks or leaves or whatever you can find. Never inhibit their exploration. If they make a total mess of something you thought you'd love to frame and hang on the wall, do not say a word. I have been known to whip the paper away and replace immediately with a fresh piece when I noticed something exceptional. But only if they're in a flow zone and not particularly responding to the piece before them. Know that the frustration and yearning is wonderful. Like an elastic band suffering exceeding tension, when the time is ripe and you are released you will hit the floor at full speed. But do just what you can do now... abstraction is great because you can do quick layer additions or little colour studies. Create a habit of observational drawing. Even if you see yourself as an abstract artist, observational drawing is a highly nutritious activity for developing the aesthetic sense. Refining your eye for detail and your response mechanism will not only improve your personal discipline, but will also freshen up your creative expression like nothing else. And by the way, please let your kids see you draw! Let them see you see an object and respond to it. Blind contour drawing is a high value/ time efficient exercise with perfect emphasis on process over product. I use it as a warm up for my students, and despite the initial dubious facial expressions, they were always fans of it in the end. I'm such a strong advocate, I'm thinking I'll do a blog post aaaaaall about it. Stay tuned! Never stop searching and learning, and don't be so quick to categorise yourself in any particular style. If I say "Angela Miller, alcohol ink artist", because that's what I've been exploring, I feel I limit my future adventures and enslave myself to one medium or one style of art. It's laughable. I would never label myself as anything but a creative explorer. Not saying you shouldn't settle in to something to really get to know it, but don't corner yourself in there with a label. There is so much more to experience! Keeping an art journal is a wonderful way to experiment and track your adventures. It's something that could go on that slide-away tray so you can paint in there and let it dry, stick inspiring things in and write out your thoughts and pondering. So there you have it. Even as I write this I have to stop every 2 sentences and help somebody get something or referee a heated discussion and enable justice and understanding between siblings (it's school holidays here in Australia) The whole downstairs is beginning to look like a disaster zone. But look! I actually have finished it. So anything really is possible, we just need to expect a different sort of process, and try not to spend too much precious mental energy on feeling frustrated. Chill babes. Your time is now, but it's also coming too. Here's to us!! I always love to hear your thoughts below, and anything you may have to add that will help us all through. The merriest of holidays to you and yours! Safe travels and I'll see you on the flipside. 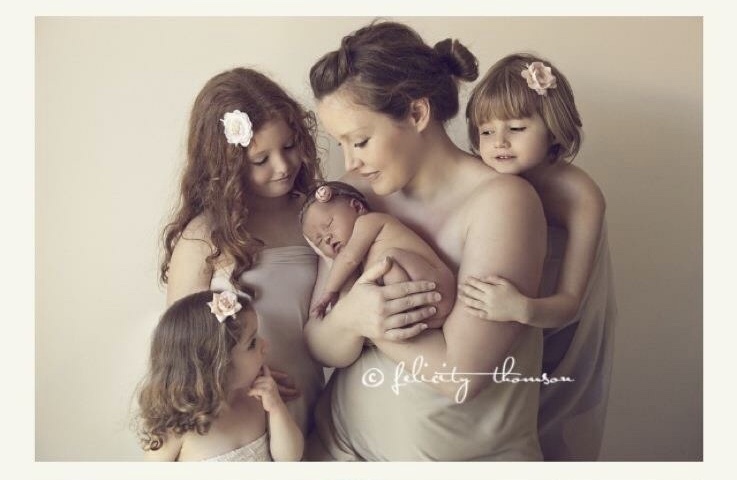 My girls and I, a week after the birth of my fourth bebe. Photographed by the talented Felicity Thomson. Don't want to miss a thing? Sign up to receive notice of blog posts and news from my studio. I forever respect your privacy.